Master of market research and central pillar of the marketing and PR team, Karine keeps the finger on the pulse of changing trends in our region. 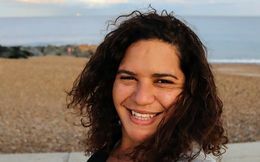 Parisian born, Karine brings her experience of working for internationally based companies to the Game Anglia team. With a degree in business, she has a passion for ensuring our raw data is up to date and ensuring our marketing accurately reflects our unique insight we are gathering through research. Having joined the team as an event volunteer in 2017, Karine has become part of the Marketing and PR team; liaising with universities and colleges across the region and planning the logistics of our events.